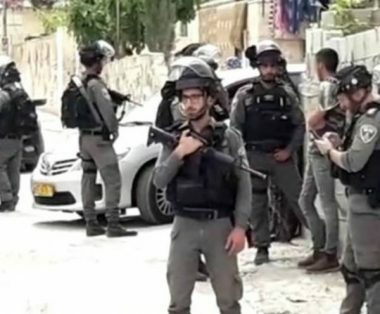 Israeli soldiers invaded, on Thursday afternoon, the town of al-‘Isawiya, in occupied East Jerusalem, mildly injured a child and abducted a Palestinian woman. Mohammad Abu al-Hummus, a member of the Follow-Up Committee in al-‘Isawiya, said dozens of soldiers, and police officers, invaded the town just as the students were leaving their schools. He added that the soldiers invaded homes and abducted a Palestinian woman, identified as Hayat Mheisin, the mother of Ismael, who was recently abducted by the army and is still under interrogation. Furthermore, the soldiers fired rubber-coated steel bullets and concussion grenades at random during the invasion, wounding a child in the lower limbs, and causing many to suffer the effects of teargas inhalation.